The rapid scale of development in the LNG market demands that infrastructure growth keeps pace – not only in terms of scale, but in terms of supporting the demands of a diverse market. Demand continues to grow beyond traditional hubs, requiring infrastructure that is more flexible, cost-effective at smaller scale, and adapted to the needs of a range of locations. At the same time, this infrastructure must develop quickly to meet demand, in a manner that is efficient in terms of capital expenditure, and sustainable in the long term. The UTS consists of a floating platform connected to floating cryogenic hoses. (Credit: Connect LNG). Asia provides a good example of how demand patterns are likely to diversify. Last winter, in China, LNG demand hit an all-time high after it was leveraged to combat smog, setting the country on course to take over from Korea as the top importer in the region. Elsewhere in Asia, new demand is growing fast in regions that have not traditionally been major LNG importers. Recently, Galway Group’s head of business development, Mangesh Patankar, predicted that by 2025 demand for LNG in Asia will reach 290 million tpy. Buyers in the region, such as Indonesia, Thailand, Malaysia, Singapore, and Pakistan, are expected to import a total of 60 million tpy in 2025, making up 79% of Asia’s LNG imports, compared with 21% from the region’s traditional buyers China, India, Japan, South Korea, and Taiwan. This demand must be met by infrastructure that is flexible, and in line with the needs of locations that will often require power generation infrastructure to be located away from major import hubs. The LNG-carrying fleet is diversifying too. At the beginning of the year, it was predicted that 2018 would see record growth in demand for LNG carriers, with 62 new vessels due to be handed over this year. Not only is the fleet growing, it is notable that in the past year, the proportion of FSRUs and small scale ships of 30 000 m3 has increased. Much current infrastructure at large hubs – such as jetties – is based around the needs of large scale carriers, and is not necessarily suited to smaller vessels, again increasing the need for new thinking. The rear of the UTS features profiled sections that allow tug vessels to push it from shore into location for transfer, placing high demands on shear strength of fenders. (Credit: Connect LNG). Further small scale demand is coming from growth of LNG as a marine fuel, as shipping realises its potential as a cleaner fuel that can help achieve compliance with the upcoming sulfur cap in 2020, and the expansion of Emissions Control Ares (ECAs) around the world. With nine ultra-large LNG-fuelled container ships on order, CMA CGM is pushing LNG shipping further towards the mainstream. The cruise segment is following suit, with Carnival due to receive two LNG-fuelled cruise ships in 2020 and 2022. While demand is growing, and gas is readily available, the cost of developing transfer infrastructure risks reducing feasibility of power generation, terminal, and bunkering projects. Infrastructure needs to move quickly to meet demand, and, at the same time, ensure that projects are economically feasible, and sustainable in the long term. Cryogenic floating hose technology is a crucial part of the answer to the challenges posed above. Firstly, it can create turnkey infrastructure projects that drastically reduce the capex and environmental impact of LNG import infrastructure. In many locations, jetty construction may be unfeasible, either due to harsh conditions, or the depth of the water in a given location, which might be either too deep to allow construction, or too shallow to allow vessels to come alongside. Secondly, floating hoses offer new possibilities for ship-to-ship transfer. Transfer between a carrier and FSRU, for example, has traditionally needed to be behind breakwaters, due to the complexity of handling side-by-side transfer. However, floating hoses in tandem configuration mean that transfer can occur in a far greater range of locations. This configuration increases the distance between vessels, ensuring safety, while the flow rates of 12 000 m3/h reduce the time window – both of which are important factors in safe transfer. This greatly increases the range of potential FSRU locations, opening up stretches of coastline where previously wave conditions would have prevented transfer. The UTS broadens the range of potential locations for LNG transfer. (Credit: Connect LNG). This type of technology requires specialist design features, which are evident in the unique design of the Cryoline LNG hoses developed by Trelleborg’s oil and marine operation. Cryoline hoses embody a unique dual-carcass design. The inner cryogenic hose consists of multiple polymeric film and woven fabric layers encapsulated between two stainless steel wire helices – one internal and one external. While the internal hose provides resistance to internal pressure, the outer hose provides protection from the external environment. The film layers provide an impermeable barrier, with the mechanical strength of the hose coming from woven fabric layers. The outer protective hose uses flexible rubber-bonded hose technology, known for high resistance to fatigue and harsh environmental conditions. Fibre optic technology is incorporated into the hose to ensure real-time monitoring of the LNG transfer. This technology was put to the test in September 2017, when it was used in the first sea launch of the Universal Transfer System (UTS), developed with Connect LNG. The success of this launch demonstrated the vast potential of floating cryogenic hoses for unlocking new infrastructure possibilities. 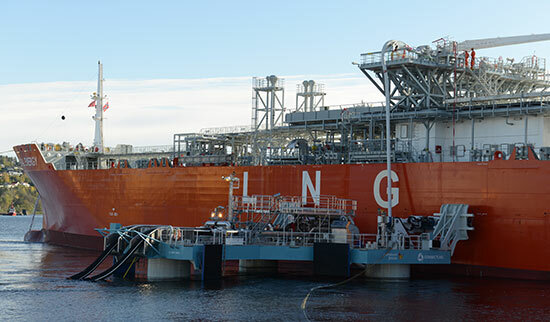 The sea launch of the UTS saw LNG transferred from the small scale LNG carrier Coral Energy to the onshore terminal at the Norwegian port of Herøya. (Credit: Connect LNG). 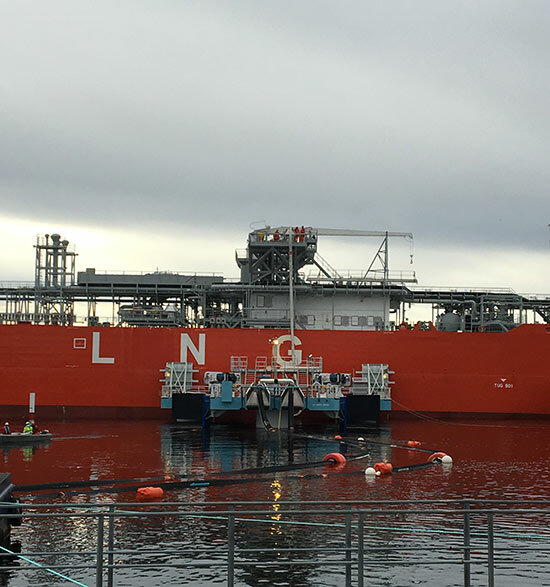 The sea launch saw LNG transferred from the small scale LNG carrier Coral Energy to the onshore terminal at the Norwegian port of Herøya using the Universal Transfer System (UTS). This marked the first transfer to be conducted using this technology, developed in partnership between Trelleborg, Connect LNG, and Gas Natural Fenosa. The system consists of Cryoline LNG hoses from Trelleborg’s oil and marine operation, attached to a floating platform designed to manoeuvre offshore to meet a vessel, rather than requiring it to moor at shore. The UTS is a ‘plug and play’ solution, requiring no modifications to the LNG carrier, and therefore removing the need for costly and environmentally intensive dedicated harbour and jetty structures. By allowing a greater level of flexibility, the UTS addresses an infrastructure challenge that is becoming increasingly vital to the evolution of the LNG market. This solves the problem by bringing the infrastructure to the carrier, reducing the need for extra construction, while also enabling transfer in areas that would be otherwise unsuitable – for instance, too shallow for carriers, or too deep to construct a jetty. It also allows transfer infrastructure to be relocated when out of use, or for maintenance, or brought into port to avoid damage from adverse weather, as well as freeing up space and time in busy ports. The requirements for the UTS demanded advanced solutions from Trelleborg’s oil and marine operations, as well as Trelleborg’s marine systems operation. In addition to Cryoline technology described above, the platform needed solutions to make it safe, and to accommodate the tugs that would push it into position. Trelleborg’s marine systems operation supplied its industry-leading Universal Safety Link (USL) 8810 to monitor the LNG transfer process. A triple fibre optic, five pin SIGTTO and pneumatic system was supplied to ensure all-round flexibility for the platform for any visiting vessel. The rear of the UTS features profiled sections that allow tug vessels to push the UTS from shore into location for transfer. This places high demands on shear strength of fenders, requiring the use of Trelleborg’s Super Cone fenders. SeaGuard fenders were used at the front of the UTS to absorb berthing impact against the larger LNG vessel prior to attachment to the vessel. One of the most important findings of the test was the value of the integrated monitoring system in the Cryoline hose. This allowed temperature to be accurately measured in real time during cool down and flushing operations – while the hose is cooled to the necessary temperature to receive LNG, and while excess liquefied gas is flushed from the hose at the end of a transfer. The ability to monitor temperature throughout the hose proved invaluable in minimising boil-off, by making sure gas was only transferred when the hose was sufficiently cooled. As LNG’s role in the global energy mix increases, it is imperative that transfer technology keeps pace; the UTS is the latest success in a sector that is evolving fast to facilitate the spread of this flexible, clean alternative fuel. The UTS test provides just one example of how cryogenic hose technology can unlock new possibilities. Although able to be deployed rapidly, and capex-light, this type of infrastructure is not a short-term solution (although it does make decommissioning easier, if necessary). The significant lifecycle benefits delivered in terms of ease of maintenance, and protection from adverse weather, as well as the ability to carefully monitor and minimise boil-off show that it can be a viable solution in the long term. 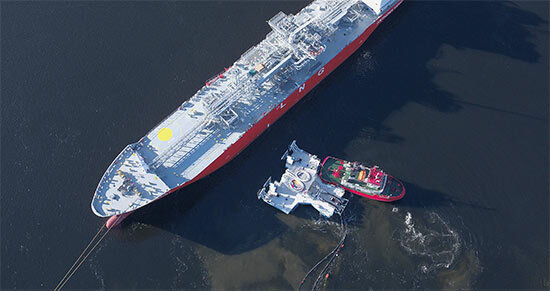 While it is difficult to predict just how the LNG market might evolve in the next few years, we can be certain that the adaptability of cryogenic hose technology (with the global cryogenic equipment market estimated to reach a value of US$23.5 billion by 2021) will continue to deliver innovative solutions to make sure the spread of this clean, versatile fuel continues.